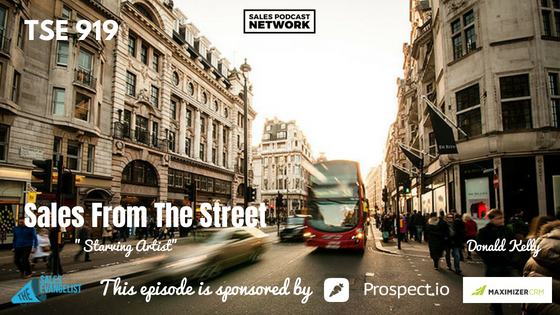 TSE 919: Sales From The Street:"Starving Artist"
The notion of the starving artist has been around for many years, but many entrepreneurs spend a lot of years “starving” as well. For sales professionals, when we don’t have processes in place to keep our funnels full, we can find ourselves “starving” as well. On today’s episode of Sales From the Street, Arty Goldstein and John Antonacci from Video Jungle Podcast are interviewing me about this very topic, and what we can do to make sure we aren’t starving artists in the sales world. The podcast will sound a little different because John and Arty are interviewing me on their show. 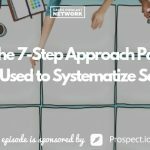 I’ll share my ideas about processes and systems that can keep you from starving in the sales industry. Much of my early strategy as a sales rep was trial and error. I messed up a lot, and I’m guessing many of the listeners will relate to that from their own experiences. Many freelancers assume there’s a big magic formula to success, but I’ve discovered that the simplest bet is to be a personable person. After that, differentiate yourself. In order to be successful, do the opposite of what everyone else is doing. If everyone else is going one way, figure out if you can go the other way and accomplish the same thing differently. My idea of hustle is to do whatever it takes to make things happen. Think outside the box: what can I do to be different and out-hustle, outwit, go around, or go over to connect with people? Sales has changed a lot since its early days of cold-calling and bartering. At the same time, though, it’s still largely the same. It’s an exchange of value. What can I give you in exchange for the thing you give me? It translates across all platforms and all mediums. In the context of video production, you’re creating value. At The Sales Evangelist, I want to help new and struggling sellers find more ideal customers, build stronger value, and close more deals. I struggled with those things when I was new to sales, but I figured out that if sellers can understand those three areas, they’ll never be hungry. No salesperson should ever be broke, so if you’re broke, something is wrong. If your organization’s sales process is broken, it will churn and burn people. My buddy Jared Easley, co-founder of Podcast Movement, hosted me on his podcast and he told me I should be doing my own podcast. I decided to try it and see where it would go. My dream was to influence people the way Pat Flynn does and to impact people’s life. Apple Podcast has made it so easy that initially, I didn’t advertise much. I asked all my cousins, family members, friends, and anyone who had the ability to get to a computer to go and rate my podcast. That launched me into the New and Noteworthy category in 2013, which got me some more visibility. When I landed Jeffrey Gitomer as my first guest, that pushed me into a world where people were looking for sales. At the time there were only like four sales podcasts that were really doing anything well at that time. To be honest, I’m different than other people out there. Many of them at the time I launched were white guys, and I was a young black guy. The result is that mine is the number one podcast in Jamaica. I’ve been actually selling since I was about six, although I clearly don’t count that in my professional selling history. In Jamaica, there aren’t 7-11’s on every corner, so people set up little tiendas in their houses and they sell things. My family had a little shop and I sold stuff there. I wasn’t afraid of talking about and dealing with money because I’ve been doing it since I was very young. Fast forward to college where I figured out that I really like to be in front of an audience and to teach. After college, I started selling professionally and I figured out that I wasn’t good at b2b selling. I got training and saw a major improvement, and discovered that I could share that with other people who were in the same boat. When I did, I saw an increase in my sales and I started actually making money. 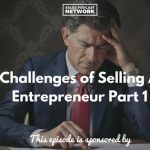 I launched the podcast in an effort to help other rookies learn about sales and to speak about effective selling. The Sandler Sales Training Organization taught me a technique that I’ve carried with me to this day, and it’s this triangle principle. Attitude, techniques, and behavior. Your attitude is what you bring to the game and your techniques are things like how do you ask questions. Your activities are the actions you carry out every day like phone calls, prospecting, emailing and dialing. That fundamental principle helped me realize the importance of procedure. If you’re winging it, you’ll have a hard time being consistently effective. If you never practice or follow a pattern, you’ll never be as successful as you could be. Video is one of the most important things at our disposal. You can say so much more in a video than you can say anywhere else. The second largest search engine in the entire world is YouTube. Video allows you to follow, see, and learn. You can educate people using video. People also like a personable approach, as evidenced by the demand for reality TV. People want to see something that’s real instead of something that’s highly produced. When there’s a dog barking in the background, that’s real. Marcus Sheridan told a story of marketing people who were sending him physical resumes to apply for jobs. He challenged them to send video instead to share their capabilities and work history. Salespeople have awesome leverage in the form of video and we shouldn’t cling to past ideas simply because we’ve always done it that way. Differentiate yourself simply by using video. A lot of people won’t do it because it’s work. Also, tell a story. That part will never get old. Some people are going to be do-it-yourselfers. You can’t change that. When you create value by telling them what to do and teaching them how to do it, they’re going to trust you. They’ll understand that you know what you’re doing, and they may eventually come to a place where they’d rather have you do it for them. You might give away enough information to help them solve a single problem, but when they encounter something bigger, they’re going to come back to you. You have to plan. People often overlook planning. You also have to outperform your yesterday. No matter how good you are today, if you can beat what you did yesterday, you’re always going to thrive. Keep learning. Read. Listen to The Sales Evangelist. Never stop learning. Do you want more tips and tricks from the video? Videostrategy.org is the place to go for thoughts on production best practices, creative brainstorming, strategy and distribution tips, client relations, and much more. Go to video strategy.org.